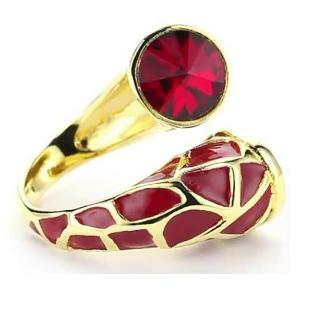 Get groovy with the Joanna Laura Constantine Red Adjustable Giraffe Animal-Print Ring. Gold-plated brass outlines caress areas of flashy ruby red enamel on the ring’s upper range, creating the impression of striped animal skin. An intense ruby-red crystal looms at the ring’s opposite range — a solitary stone crowned by a gold-toned circle. This ring adjusts in size from 6.5 to 7.5. Your quirky new accessory measures 3 millimeters in width and 1 inch in length. Available also in black and grey. Accessories Designer Joanna Laura Constantine began her career in the hospitality industry and switched career paths to express her passion for design inspired by her roots and childhood in Lebanon. With a Master of Business, Joanna forged ahead, left her family and friends and moved to New York City to earn her Degree in Fashion Studies from Parsons School of Design in 2007. Joanna’s work takes her back home every couple of months where she is inspired by the culture and available goods for designing and updating her pieces. Rings, bracelets, earrings and necklaces emblazoned with the bohemian chic flair of Arabic calligraphy, bold colors, striking stones, crystals and pearls force the collection into the forefront of an individuals’ signature style. The calligraphy on all work is hand done, which is a traditional art form and translates into phrases like “My Love” and the classic “JLC” Joanna Laura Constantine logo.